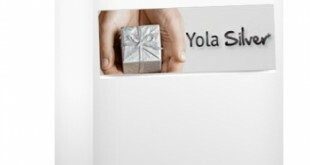 Yola want to help spread the holiday spirit and spark new adventures for everyone so they have launched their Chistmas promotion a bit early. 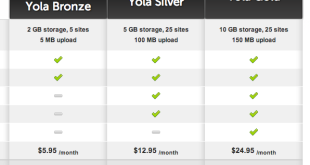 You can now score 30% off 1 year of Yola Silver and get a free .COM domain using the promo code . 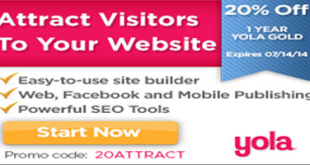 This offer ends on 1/05/2015 so you have plenty of time! 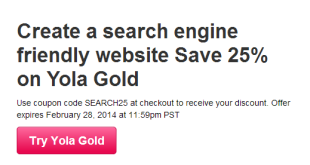 Yola Silver is probably the quickest way to create a great looking mobile website for yourself – and for the month of October 2014 you can utilize the latest Yola coupon code good for 20% off a year of Yola Silver. Simply use coupon code during your checkout process. This coupon code will stay active until October 31st, 2014. 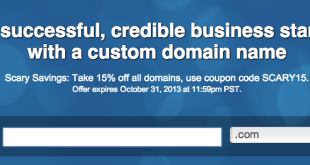 Halloween is less than a week away, and to celebrate the holiday Yola has decided to launch their Halloween themed coupon code - good for 15% off any domain name in the Yola line-up - which ranges from the usual .com and .net domain names, to various International ones such as .nl, ,de, .at and others.